That’s how TDS Field Service Technician Gabriel (Gabe) Palma described the situation when asked how he helped a man and his wife stranded on the side of the road with their vehicle. Gabe said the day was a typical afternoon in September. He was driving his TDS truck down Interstate 8 in southern Arizona when he saw a man frantically waving his hands. Gabe said, he could “tell he was in distress” and needed help. Gabe immediately pulled over, got out of his truck, opened the hood of the man’s vehicle and saw the engine on fire. Gabe ran back to his TDS vehicle and pulled out a fire extinguisher. He put out the engine fire, but in a few moments the fire kicked back up. He then ran back to his truck to get a five-gallon jug of water and poured some into the transmission, which was overheating, and then poured water over the engine. 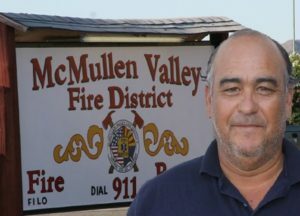 Gabe has been a fire department and EMT volunteer at his local fire department for at least “20 or maybe 25 years.” And by the way, he’s now serving as the fire chief for the McMullen Valley Fire Department in Salome, Arizona. Gabe said along with putting out the fire, he “calmed down” the couple after all the excitement. In addition, Gabe did a little work on the driver’s engine so he could make it home to Tucson that night. “He needed a little mechanical advice, which I could provide.” The next day, the family called TDS to let them know what Gabe did and express their appreciation for all his help. The family told TDS their parents had been waving their hands seeking help for about 10 minutes before Gabe stopped. Gabe is an outstanding individual not only from his incredible dedication to making things right with TDS customers when we have had issues, such as our companies DSL line, but from a personal side as well. In March of 2012, while I was out exploring with my Polaris 4-wheeler, high in the mountains outside of Salome and many miles from anyone, I flipped my 4-wheeler over the top of me, having it weight several hundred pounds, it severely incapacitated me. In some miracle, still unknown today, I managed to get a brief 30 second call to a friend using my cell phone to notify them I had been in an accident and my last known longitude and latitude coordinates. Within minutes, Gabe was notified of the situation and called in Airlife support and then personally drove out in the middle of nowhere, which was no easy task to where I was at, to aid assistance and help me get home safely. I’m sure there is many people that Gabe has helped in similar situations on a regular basis, but I for one, am very grateful for his unwavering self-sacrifice for his fellow man. Dwight thank you for sharing this story. So glad Gabe is part of the TDS team! I grew up with gabe palma, an awesome friend an always willing to help a person out anyway he can.he is a asset to our community.